Charge up your hookah sessions with the Volt E-Vapor Hookah Bowl! Made by Vapor Hookahs, these electronic hookah devices go right on top of your traditional hookah of choice. Both unique and innovative, Vapor Volt hookah bowls are the latest and greatest way to smoke hookah. Browse the Vapor Volt hookah selection from SouthSmoke.com and see what smokers all across the US are raving about. As hookah smokers, we all have our favorite flavors. Some of us prefer the tang of Double Apple, while others like the silky-smooth flavor of Chocolate. Perhaps that explains the rising success of the Vapor hookah bowl. It is compatible with any kind of e-liquid or e-juice sold here at SouthSmoke.com. Do you have a taste for the out-of-this-world flavor of Space Jam E-liquid? Or perhaps the freshness of Fantasia e-juice? Any and all are perfect for the Vapor Volt hookah bowl. Simply attach the Volt to the top of your hookah, pour your e-liquid in, and start your smoke session! The Volt hookah bowl by Vapor Hookahs is a marvel of technology. Using the latest top-of-the-line technology combined with the traditional appeal of tobacco hookahs, the Vapor Volt collides the past and the present into a unique experience you'll love to revisit again and again. 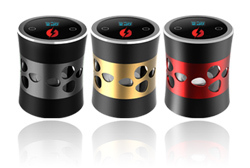 Each Volt Vapor Hookah bowl is comprised of a 10 ml plastic e-liquid tank and atomizer, a 2400 mAh battery, an LED battery charger display, a puff counter, and an inhale timer. The puff counter is great for smoking socially, as you can tell right on the bowl itself approximately how many puffs are left. Choose your favorite traditional hookah and set your hookah bowl on top. Instead of tobacco, shisha, and charcoal, all you do is add e-liquid into your Vapor Volt. 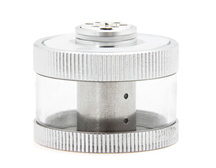 The atomizer turns the e-liquid into vapor instead of smoke. That's all the flavor with only a fraction of the work for great hookah smoking! We at SouthSmoke.com also sell replacement parts to keep your Vapor Volt hookah bowl in prime smoking condition. We have replacement Vapor clearomizers for sale. These are the flavor tanks that hold e-liquid and atomize it into vapor. Just unscrew the top, fill the clearomizer, screw the top back on, and attach it to your hookah of choice. All our Vapor Volt clearomizers come with the heating coil included. You may also purchase replacement heating coils if that is the only part you need to replace. Simply remove the old heating coil from your clearomizer and swap in the new one. If you ever need to clean your Volt heating coil, gently wipe it with a clean cloth. NEVER get the heating coil wet! We at SouthSmoke.com have the very best Vapor Glass Hookah products. Use the Vapor Volt with any of Vapor's renowned all-glass hookahs. These glass Vapor hookah pipes are truly things of beauty - perfect for combining with the Vapor Volt. We also sell e hookah vapor pen products if you're looking for a more convenient on-the-go smoking option. But if you're looking to have quality time, we can't recommend the Vapor hookah bowl enough! Find your Vapor Volt hookah bowl and products here at SouthSmoke.com!